Happy Halloween!! Or should I just say Happy Best Day of the Year Ever? I’ll go with the former only because it’s shorter, but my true sentiments are honestly reflected in the latter. I look forward to October 31 everyday of the year, and I usually know what my costume is going to be on November 1. What can I say? I live for Halloween. Despite what you may think, Halloween is not a holiday invented by the candy companies, although it would have been genius if it was. Halloween has a long history, and I could bore enchant you with it, but I’m too hyped up on candy. So, instead, I’ll just tell you about my costume. I dressed up as Spaghetti and Meatballs. 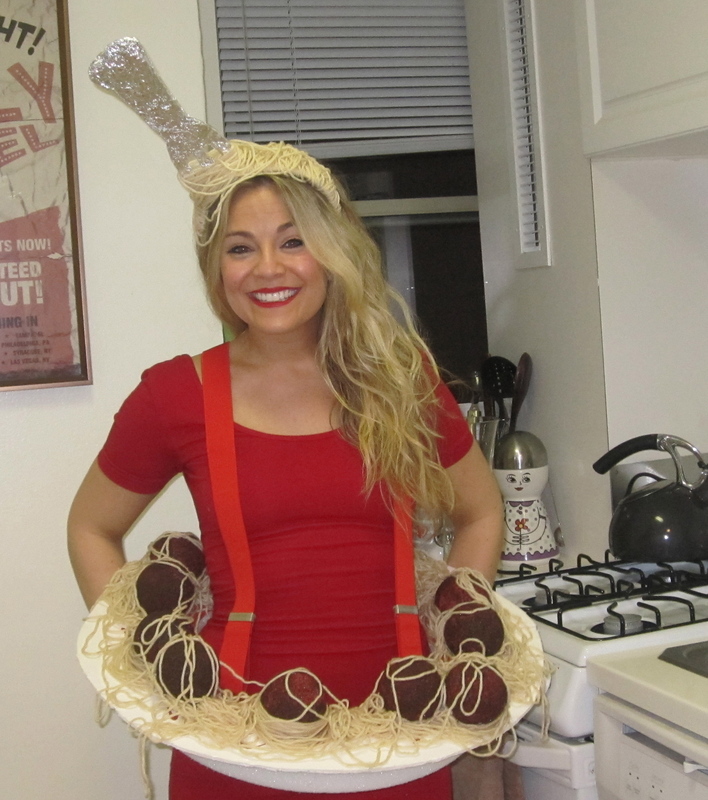 Yes, you read that correctly, but just in case you need to hear it again, I dressed up as a plate of Spaghetti and Meatballs. I mean, would I really be The Bite-Sized Blonde if my Halloween costume didn’t revolve around food? Although I look good enough to eat, if I do say so myself, my costume was less than edible. So, if I got you in the mood, for spaghetti and meatballs that is, then stayed tuned for my recipe! and oh yea, Happy Halloween!